Walking into the fabric store often results in sensory overload for fabric addicts like me. So, this week I decided to take a step back and work with my favorite fabric of all time: unbleached muslin. That’s right. I LOVE plain old muslin because it invites creativity in a way that the wild prints I often sew into aprons just can’t. 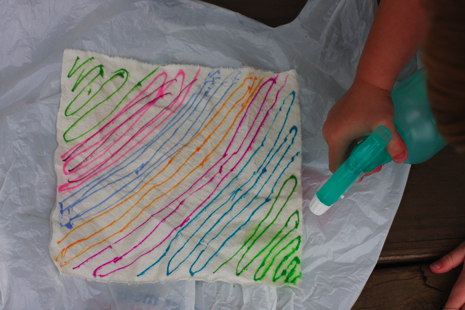 Muslin is a blank canvas and so fun to color and stitch into one-of-a-kind projects. I spent some time in Gail’s studio and was really inspired by her color sense and amazing talent for creating vibrant and intoxicating fabrics. She taught me the easy DIY fabric design techniques that I demonstrated on today’s Take Five & Company segment. Keep on reading for the details. Fabric Bleaching with Dishwashing Detergent: Use a gel dishwasher detergent containing bleach (I used Cascade brand) to paint, stamp or stencil your design on a dark, 100 percent cotton fabric. Let sit until you can see that the detergent has lightened the fabric where you applied the detergent. Then soak the fabric in a mixture of 1 part vinegar to 3 parts water for about 15 minutes to neutralize the bleaching action. Wash and dry the fabric then use it for your next sewing adventure.